The Abbey Store provides the unique opportunity for visitors to purchase a wide variety of fine gourmet food, gifts and books. In addition to being the largest religious bookstore in Georgia, the Abbey Store is also the best place to find handcrafted stained glass masterpieces. 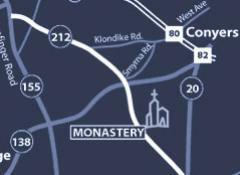 Be sure to check out all our store has to offer during your visit to the Monastery! The Abbey Store offers a large selection of books, music, videos, free trade items and jewelry. There is also a wide assortment of monk-made fruitcakes, fudge, biscotti and cookies to sample, as well as collection of the Monastery’s handcrafted, stained glass masterpieces available for purchase. Browse our Store, take a snack break at our Café, or enjoy a small meal in a pleasant setting off of our Central Courtyard. New Year's Day, Easter, Memorial Day, July 4th, Labor Day, Thanksgiving and Christmas.